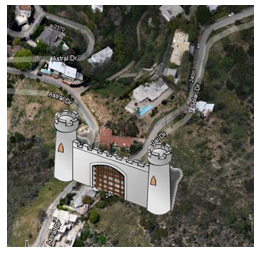 RETHINKING LA - The City of LA’s recent decision to close a small Hollywood Hills cul-de-sac and to allow the residents to build a locked gate that excludes the public but provides access to the residents is under attack as a violation of state law. Solar Drive is a small road that dead-ends above Runyon Canyon, popular to tourists in search of a great view and to hikers in pursuit of a less congested route to the popular canyon trails. Residents have long complained about traffic and congestion but the recent move to close Solar Drive to the public was attributed to “loitering, littering, smoking and drinking” and the recent City Council approved solution was to allow the residents to build a gate that the Solar Drive residents operated and maintained. Their lawyer has submitted a demand to City Attorney Carmen Trutanich, [link] pointing to the CA’s legal obligation to serve his client, the City of LA, with sound legal advice that includes warning the City Council of the illegal nature of the street closure and the resulting liability to both the city and the residents of Solar Drive. The Hollywood Hills area is no stranger to debates over public access vs. public safety and periodically attempts are made to close streets with gates or to close stairways that connect neighborhoods. The Whitley Heights Civic Association went to the City Council in 1985 for permission to build gates that would keep the public out of their neighborhood. They built the gates but Citizens Against Gated Enclaves (CAGE) sued them and prevailed in Superior Court and then again in the Appellate court, bringing the decade-long battle to an end with the removal of the gates. The fact that locals have complained of criminal activity in the area as justification for the restriction of the public from Solar Drive falls far short of the legal minimum and is unsupported by the City Council motion that referred to “loitering, littering, drinking, and smoking” as the security issues. Nuisance misdemeanors hardly qualify as “serious and criminal activity” nor do they justify a violation of state law by the City of LA and the residents of Solar Drive. “Inconvenience, disturbing the peace, and potential problems” fail to qualify as conditions that would satisfy the CVC 21101.4 street closure conditions. There are some that consider the Solar Drive street closure to be the opening move, one that sets up more street closures that will address the complaints of residents throughout the Hollywood Hills. Recent community meetings have addressed the increasing congestion in the hills caused by tourists in search of the Hollywood Sign and hikers in pursuit of hilltop trails, all to the dismay of the residents who moved to the Hollywood Hills to get away from the crowd. As the grumbling escalates and tensions increase and the call for street closures continue, the impact of the Solar Drive gate will be powerful and will establish precedent that can be used in other areas to close cul de sacs and stairways, a situation that many consider not only unacceptable but illegal. RETHINKING LA - In an all-too-common demonstration of synchronized confusion, the City Attorney’s office has directed the LADOT to suspend enforcement of the city’s Apron Parking ban, reversing its prior position and leaving more unanswered questions in its wake. For those people who have been cited but have not yet resolved their citations for violating the City Attorney’s creative interpretation of the “parkway parking” ban, do they still have to pay their tickets for an offense that is no longer offensive? For those people who have been cited but did not pay their citations, triggering late fees and penalties, does the moratorium apply to the collection activities that include credit reporting and legal action? For those people who park parallel to the curb line, in their driveway but without blocking the sidewalk or the travel lane in the street, are they also included in the moratorium? For those people who have received citations for apron parking and who have paid their $58 tickets, are those debts forgiven and are they entitled to a refund? The City Council is to be commended for acting decisively to address the debate over Apron Parking with a resolution to suspend enforcement while the definitions are debated and clarified. This allows residents (who are aware of the action) to use valuable real estate in congested neighborhoods to park vehicles, all while leaving the sidewalks open and clear for pedestrians. Of course the term “decisively” in this case actually amounts to allowing the debate to roll along for years until it reached a crisis point that saw community members take to the streets with picket signs, calling for their council representative to act with resolve. At issue is the practice of parking personal vehicles in residential communities in the driveway, between the street and the sidewalk or between the sidewalk and the garage, a common time-honored practice that maximized parking capacity on private property. The controversy over Apron Parking resulted from the overzealous use of driveways for parking, especially in Westwood, that resulted in blocked sidewalks and triggered an ADA complaint against the city for allowing violations of the California Vehicle Code prohibition (CVC 22500) against blocking the sidewalk with a parked vehicle. No mention was made of those cited over the last few months, in the period of time between the City Attorney’s first instruction to enforce LAMC 80.53 and the City Attorney’s second instruction to suspend enforcement. The residents of LA were in the dark when the controversial enforcement of LAMC 80.53 began and were effectively left in the dark when enforcement was suspended. Those left holding receipts, citations, penalties and collections notices deserve resolution that recognizes the flawed process and the uneven application of the law. 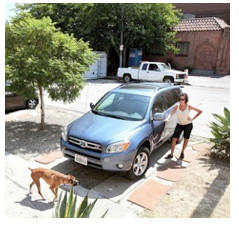 Most of all, the residents of LA who live in properties with long driveways and apron parking spaces deserve real answers that allow them to live their lives without being left in limbo when it comes to parking their vehicles. For a recap on the “parkway” controversy, read “Time to Curb LA’s City Attorney,” and “The Public’s Search for Parking, Nuch’s Search for Revenue.” To follow the journey of two neighborhoods through this drama, visit StopLADOT and PalisadesParkingPatrol. PEOPLE POWER - The trek to City Hall in order to make two minutes of public comment on an issue that appears to be a done-deal can be such an idealistic but unrewarding experience. But three different campaigns demonstrated that it really does make a difference. ● The City of LA’s Administrative Citation Enforcement program was well on its way to the City Council, fueled by such confidence that Councilman Koretz released the victory announcement in advance of the victory. He should have waited. For two weeks in a row, opponents of the City Attorney’s proposed version of the ACE program spoke before the Budget & Finance Committee, raising enough concerns to prompt Councilman Rosendahl to declare "This ordinance is half-baked!" The proposed ACE program ordinance was sent back to the City Attorney’s office for repairs, a process that is meant to reconcile the differences between the vision for code enforcement and the reality of the City Attorney’s proposal. ● The Department of Transportation ill-advised enforcement of LA’s murky apron-parking prohibition prompted a City Watch article that challenged the City Attorney’s motives and another article that challenged the legality of the City’s newfound enthusiasm for aprons. Community leaders built websites such as StopLADOT and Palisades Parking Patrol, organized citywide pickets, and petitioned their government in the form of public comment. ● The third round of public comments to result in a victory came from the residents of East Hollywood who were in search of relief from the “code enforcement zealots” responsible for 177 over-in-height fence citations that resulted in fees, fines, and penalties that then resulted in liens, garnishments, and legal actions. The journey to City Hall took four months and began with a dozen weekly neighborhood walking tours [link] to engage the community, the local LAPD Captains, the businesses, and community groups. The East Hollywood Street Beat mobilized on the streets and then went indoors, transitioning into the LA City Works civic engagement training that prepared them for their public comments at City Hall. City Council President Eric Garcetti stepped out of the City Council proceedings, passing the gavel to Councilman Zine, and listening to the stakeholders’ stories of the complaint driven system of code enforcement that has resulted in uneven application of the law and selective prosecution of code violations. Garcetti brought in David Lara from Building & Safety and Jane Usher from the City Attorney’s office and set three solutions in play. 1) A moratorium on over-in-height fence and front yard use code violation enforcement and prosecution. 2) A moratorium on the collection of fees, fines, and penalties as well as a moratorium on liens, garnishments, and legal actions for non-compliance. 3) The creation of LA’s first Fence Height District. In each of these three examples, the work is far from done, but it’s much farther along than it would have been if the public had remained silent. These three campaigns, from the opponents of ACE to those cited for Apron Parking to the victims of zealous Building & Safety citations, all demonstrate that it pays to speak up and to partner in solutions that improve the quality of life in our neighborhoods. Bicycle Awareness: For Those in Power, Ignorance is Still Bliss! RETHINKING LA - Law enforcement officers are fond of quoting the popular standard "ignorance of the law excuses no one" when dealing with the public but when faced with an accusation of scofflaw behavior, suddenly ignorance is a solid defense. 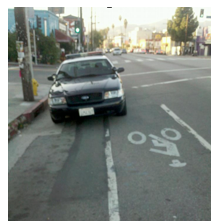 The LAPD officers responsible for the blocked Bike Lane pictured above are going to have a hard time explaining why they were out shopping on Sunset Blvd instead of protecting and serving, but as for the illegal parking job, it’s not their fault. They merely need to plead ignorance and then point to the DMV. From the top down, the State of California and the City of Los Angeles need to get together and embark on an education program directed at those in charge, those responsible for operating this state and this city. Between the DMV’s car-centric creative interpretation of the law and the CHP’s complete ignorance of the rules of the road as they apply to pedestrians and cyclists, [link] it is apparent that the real opportunity to make our streets safer for everybody is to start with those in power. Last year, the LAPD developed a Bicycle Awareness training [link] program for its officers that firmly established the rights of cyclists on the streets and replaced “ride to the right” with “ride where it’s right” as the principle for lane positioning. Bike Activists were given the opportunity to participate in the development of the program and the Cyclist/LAPD Task Force was optimistic that the Bicycle Awareness training would have a significant impact on the streets, turning LAPD officers into partners, not adversaries. Unfortunately, the mandate to participate in the training program was not as significant as the promises made to the cycling community and it is now easier to find officers who have never heard of the program than it is to find officers who have participated and who understand the concepts. The DASH bus operator pictured here was headed north on Vermont Avenue when he came up behind me and my wife as we rode our bikes in the curb lane. Instead of dropping behind us to pull to the curb, this guy honked from behind, then pulled alongside on our left, “asserted” himself and moved to the curb in the direction of his bus stop. His willful violation of CVC 27001(a) and CVC 21750 clearly demonstrate that this “professional” bus operator is either ignorant of the law or a scofflaw, in either case, unfit for service. The City of LA’s Department of Transportation is responsible for operating a fleet of 400 buses that provides 30 million trips per year aboard the DASH, the Commuter Express, Cityride, Shuttles and Charter services. Simply training the operators of those 400 buses on the rights of cyclists would make the streets safer but that Bicycle Awareness program never made it out of the hands of the LAPD. The Metro’s Chairman of the Board is LA’s Mayor Villaraigosa and LA controls three other seats which are filled by City Councilman José Huizar, Richard Katz, and Mel Wilson. In other words, the City of LA has a tremendous impact on the operation of the Metro and a tremendous responsibility for its performance. Perhaps it’s time to share the LAPD’s Bicycle Awareness program with the Metro! LA’s Department of Water & Power moves a lot of equipment through the streets of Los Angeles, relying on a combination of staff and contractors to operate its fleet of trucks. The incident pictured here is still being debated by LA’s policy makers and City Attorney, resulting in a clear demonstration of the need for greater education and an understanding of the rules of the road. Are crosswalks an extension of the sidewalk? If so, can cyclists ride in the crosswalk? If not, how do we explain the Orange Line Bike Path? Through it all, once the debate is put aside, the important thing to remember is that the City of LA operates huge pieces of equipment on local neighborhood streets that are surrounded with homes, populated with families, and filled with pedestrians and cyclists who have as much right to the streets as the professional vehicle operators moving the City of LA’s equipment. LA is a company town and our neighborhoods are Hollywood’s backlot. That’s one of the things that makes LA such a magical city. The film shoot pictured above should have lane closure and traffic control so that cyclists riding downhill on Sunset get the same respect that motorists would get if the lane ahead were closed. Detours that appear with no warning, manhole covers that aren’t flush with the surface of the street, cracks between asphalt and cement bus pads, gutter pans that aren’t flush, poorly positioned water mains, divets from special event equipment, and drain grates that run parallel to the curb are all deadly road hazards for cyclists. For all the promise of Eurotopian Bikeway engineering, the real opportunity to engineer our streets for cyclists is to start by educating those responsible for maintenance and repair of our streets on the needs of cyclists and on the difference between a Hummer and a Huffy. Mayor Antonio Villaraigosa has embraced cycling as a viable mode of transportation and has committed to supporting cyclists with the full force of his Mayoral authority, directing City of LA department heads to partner with him in making LA a Bike Friendly city. If he is serious about his commitment, he’ll make Bike Education a priority and he’ll start by educating the City Family on Bicycle Awareness, from the LAPD to the DWP to the LADOT. Imagine 40,000 City of LA employees going about their business with a new sensitivity to how streets work, to the rights of cyclists, to the repair, and maintenance of streets so that they are safe for everybody. For all the talk of “40 miles a year” of Bikeways improvement and millions of dollars in Measure R money, the real opportunity to move LA forward immediately is to embrace Bike Education, for cyclists, for motorists, for the LAPD, for the engineers, for the policy makers and the pothole fillers, so that the people who use the streets understand how to integrate cyclists into the traffic mix. The journey to City Hall took four months and began with a dozen weekly neighborhood walking tours to engage the community, the local LAPD Captains, the businesses, and community groups. The East Hollywood Street Beat mobilized on the streets and then went indoors, transitioning into the LA City Works civic engagement training that prepared them for their public comments at City Hall. RETHINKING LA - Last week City Watch LA took LA’s Housing Department (LAHD) to task for its controversial Rent Escrow Account Program (REAP) charging that it preyed on small landlords, failed to deliver the oversight it promised, left tenants in limbo and provided a safe-haven for squatters. Over the weekend, the plot thickened as the LA Times covered a Housing Department employee who exploited her relationship with immigrant landlords, collecting payoffs from them and steering them to her contractor husband. The employee was convicted of felony bribery charges while her husband, also charged in the case, left for South Korea where he remains out of reach of police. Most damning for the City and the Housing Department is the clear lack of oversight and accountability that has been revealed in incident after incident, going back ten years to when Laura Chick conducted an audit and declared REAP broken. Last year’s arrest and conviction of an LAHD employee failed to motivate LAHD management to call attention to the case, leaving high-level officials in the city attorney's office, the Personnel Department and the Department of Building and Safety in the dark until informed by the LA Times. The Assistant General Manager responsible for the REAP program, Robert Aldape, didn’t investigate further to see if there were other incidents, saying employee communications with customers aren't closely monitored. Speaking of the convicted employee, Aldape said "We simply don't know what interactions she had, people come to the public counter all the time, so there would be no way to track it." Insiders at the LAHD contend that Aldape has personal motivation to take a laissez-faire attitude, pointing to his prior role as the “executive director” of the LA Housing Law Project, a “tenant advocacy non-profit” which he operated right out of his law office, a private firm that made its money by suing small landlords. This two-hat journey to the #2 position at the LAHD has allowed Aldape to position himself as a “non-profit director” when dealing with housing issues but as a “law firm principal” when making campaign contributions. Over the last decade, a cottage industry has blossomed in support of REAP, made up of nonprofit corporations that provide “tenant outreach services” under contract with the LAHD. Critics charge that the nonprofits, once armed with critical information from the LAHD, turn their contracts into lawsuit generation machines against the small landlords who lack the sophistication to fight back. Faced with a lawsuit, many of the small landlords simply roll over, negotiate a monetary settlement, and look for an exit strategy. A review of the nearly 1700 properties under the REAP control reveals a disproportionate number of 2 to 4 unit buildings that have been taken from the control of the property owner, serving as anecdotal evidence in support of the landlords’ charges. The City of LA has heard the allegations of those who claim to suffer at the hands of the LAHD, prompting Councilmember Parks to call on the LAHD and the City Attorney’s Office to investigate the complaints and come up with a report. This self-evaluating systemic of oversight is somehow sufficient for the City Council but when an employee was convicted of felony bribery, Aldape claimed an inability to monitor the actions and communications of employees. Charges that the LAHD has been run as a personal fiefdom of upper management go back to the days of Mercedes Marquez who left for Washington DC in 2009 to take a position as Assistant Secretary of the Housing and Urban Development Department. Critics claim that Marquez left in her wake a highly polarized and demoralized department that continues to take its direction from political patrons, leaving potential whistleblowers in fear of the self-investigating regime, and communities vulnerable to the REAP administration that leaves tenants, landlords, and neighbors equally abused. Landlords, tenants and neighbors complain that the good intentions have failed to materialize in good performance, resulting instead in foreclosed properties, blighted buildings, and neighborhoods terrorized by squatters. Demonstrating the controversial nature of LA’s housing program, the Mayor’s Deputy Mayor of Housing & Economic Development Policy is now referred to as the Deputy Mayor for Economic and Business Policy. LA’s Housing Department is in such dire straits that even the Mayor’s office knows it’s time to step away from the carnage. RETHINKING LA - What do you do when one of LA’s largest landlords fails to perform its business according to the law and creates a condition that leaves tenants, neighbors, and property owners vulnerable to crime, blight, and unsafe conditions? The simple answer is to call LA’s Housing Department (LAHD) which is responsible for providing oversight to approximately 780,000 rental units throughout the City of LA. LAHD conducts a series of programs that all have some authority over the establishment, operation, maintenance, and occupancy of rental units and is responsible for inspecting properties, protecting tenants from illegal evictions, and ensuring safe and inhabitable conditions. But who do you call when LA’s Housing Department (LAHD) is the de facto landlord, a situation that is becoming more common as the LAHD continues to inflate its real estate portfolio through the controversial Rent Escrow Account Program (REAP). Ideally, the REAP program applies to properties that have ongoing health and safety violations, and unresolved notices of compliance. The LAHD first cites the landlord, then intervenes and collects the rent from the tenants, offering a discount of up to 50% as amends for the substandard conditions, ensuring that the repairs are performed and that the property is brought up to standards. 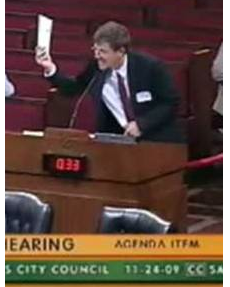 In reality, the LAHD has incurred the wrath of the last two City Controllers, prompting Laura Chick to declare “REAP is broken!” in 2001 and Wendy Greuel to demand “Show me the money!” in a 2010 audit that revealed LAHD somehow failed to even try to collect $48 million in fees and rent owed to the department. Critics of the REAP program, and there are many, include tenants who live in buildings that provide safe refuge to protected squatters, landlords who lose rental income which leads to foreclosure, and neighbors who live next to properties that go into a downward spiral of LAHD decline. In East Hollywood, there is a 74 unit building that fell victim to the LAHD’s REAP program, incurring code violations that triggered citations that accrued and resulted in the property being “seized” by the LAHD which then collected the rent and left the landlord in foreclosure proceedings. Fans of the REAP program claim that it protects the tenants, ensures repairs and maintenance, and gives teeth to the inspections and citations and demands for performance. Critics claim that savvy tenants can reduce their rent by up to 50% by damaging the property, initiating the complaints and subsequent inspections, and putting the property into a REAP tailspin that results in foreclosure and safe-haven for squatters. The 74 unit building in East Hollywood serves as testimony to the doomsday critics, resulting in a tenant claim that “our lawyers are helping the drug dealers to stay in the apartment building.” The tenants are embroiled in a two-year-long legal journey that pits lawyers against property managers as the LAHD stands by, leaving drug dealers and prostitutes “squatting” as they wait in line for a settlement. The good tenants who can afford to move have left the building, the bad tenants have burrowed in for the payoff, the landlord is fighting to reclaim the property, the LAPD contends they are helpless without the City Attorney’s support, the neighbors are reaching out for help, and the LAHD continues to operate the REAP program as if there are no problems. Farther down the street, there is a small Craftsman house built in 1913. It has a separate two-story apartment at the back of the property and it sits next to similarly sized houses that are owner occupied. Approximately a year ago, the LAHD placed the Craftsman house and the rear apartment in the REAP program, demonstrating that simply having one rental unit on a property leaves it vulnerable to the grim REAPer. The house and the apartment went into the typical tailspin, the property owner and the tenant left, and the buildings are now home to squatters who arrive mid to late evening and then leave early in the morning. Apparently the LAHD’s inspectors work 9 to 5, interrupting the squatters’ routine only slightly, a small inconvenience that allows for free accommodations with plenty of off-street parking. The current list of REAP properties ranges from duplexes to buildings with hundreds of rental units. Properties are added to the LAHD’s portfolio on a regular basis, bringing the current total to almost 1700 separate buildings. The LAHD has just been taken to task by the City Controller for failing to collect $48 million in fees and rents, for sitting on $10 million in dormant accounts, and for failing to administer the funds collected to ensure effective inspections and oversight. Add to this the ongoing claims of erratic and inconsistent oversight, inspections, and enforcement and it is apparent that LA’s Department of Housing is not only one of the largest landlords in Los Angeles. It is also one of the most irresponsible. LA’s Housing Department must comply with the same law it sets out to enforce, it must impose the same standards on itself that it imposes on others, and it must do it within the same 30 day deadline. Most of all, it must face the same threat of foreclosure and loss of income that others face. That’s when the playing field will level and the tenants, the landlords, and the neighbors of Los Angeles will be protected. RETHINKING LA - LA’s City Council deserves an award for its ability to conduct its business with a straight face, on the one hand feigning sincerity as it embraces the Occupy LA movement while simultaneously imposing property liens on Angelenos in actions that can’t be explained, let alone justified. Last Tuesday, speakers from the Occupy LA movement appeared in City Council chambers and spoke passionately about the issues that have prompted people across the country to speak up about corporate personhood, the collapsing economy, home foreclosures, economic inequity, social injustice, restricted access to healthcare and education, and a government that no longer represents the people. The City Council went on to issue a motion that ran for three pages, touching on the many issues that have prompted Angelenos to grab a piece of the Occupy LA movement, then concluding with an affirmation of Occupy LA’s 1st Amendment rights. Much was made of the Councilmembers who ventured from the Council Chambers and onto City Hall’s north lawn, home of the Occupy LA campsite that spends days on the grass and nights on the cement in an obedient nod to LA’s municipal code that allows camping, just not comfortable camping. Rosendahl and Garcetti not only toured, they requested permission to speak. “Stay as long as you need," Garcetti told them. "We’re here to support you.” He then shouted “This is your City Hall!” and the crowd responded "This is our City Hall!" Missing from the highlights of that day is the series of lien actions and variance requests that came before the City Council, all of which clearly demonstrated that in Los Angeles, it’s not what you know, it’s who you know. A resident of Jan Perry’s district appeared before the City Council to point out that he inherited a property that came with a burned out building, a fence, and a City of LA lien that prevented him from moving forward to improve the property, to sell the property, to do anything other than to allow the blight to continue. Does it take a City Council appearance to get the attention of the Council office? Does it take the City Council office to get the attention of Building & Safety? Does it require a special administrative hearing to pursue fair and effective enforcement of the city’s codes and standards by Building & Safety? Apparently, yes. Councilwoman Perry quickly asked for a continuance and promised to look at the matter. Ronald & Florence Miller then took to the podium in response to citations for excessive vegetation on their property. After their first notice, they hired gardeners to attend to the “excessive” vegetation. They then called for another inspection, which the city performed but when pressed, the inspector was unable to define “excessive” nor was he able to rule on the issue of compliance. The property owners persisted but got no response from Building & Safety. They claim to have heard nothing until they received a notice of a debt in collections from a private party. They protested the collections and the debt, putting the issue back into the hands of the City of LA which again failed to respond, until it placed a lien on the Miller property. Ronald Miller was cut off as his two minutes expired. He paused and his wife yielded her time so that he could continue speaking. Councilman Zine refused to allow Florencia to yield her time, requiring her to continue where her husband left off. Zine may have regretted his rigidity when Florencia went on to claim violations of the right to due process, the right to face one’s accuser, the right to participate in an appeal process, and the right to be free of malicious prosecution, the uneven application of the law, and the discriminatory impact of selective prosecution. The Council then immediately contradicted Councilman Reyes by voting unanimously to support the Department of Building & Safety’s recommendation of a lien to be placed on the property as a result of the “excessive” vegetation that was removed in 2009. 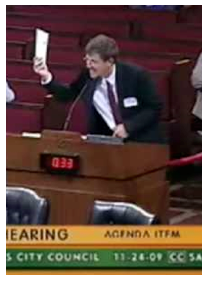 The hypocritical nature of the City Council’s strict adherence to municipal policy, municipal code, and administrative process was immediately demonstrated as Councilmember Koretz called the next item on the agenda “special” and then bent over backward to offer a stakeholder a “categorical exemption” to the law and to land use restrictions. In an effort to get around the requirement for a zone change, Koretz supported a variance request in a replay of a Council action that was recently reversed by the Court of Appeals which held that the City Council simply does not have the authority. Recent legal rulings be damned, Koretz moved to support the variance request of a favored stakeholder who can claim no legal foundation for the R-1 conversion of a rec room into an illegal apartment, resulting in a special consideration that contradicts the ruling of the zoning administrator. The Council then “listened” to legal objections, to protests from the community, to the presentation of letters and a petition in opposition to the variance, and then they voted unanimously to support the variance. LA’s City Council goes about its business with a straight face, at times throwing its hands in the air and claiming to be limited by the law, while at other times, throwing the law in the air and claiming unlimited authority to apply mercy to insiders and punishment to those on the fringe. As LA’s City Council prepares to continue with the charade of embracing the ideals of Occupy LA, it is important that the Councilmembers accept the fact that the City Council and its uneven application of the law, its selective enforcement of the law, and its failure to end the “divisive economic and social realities” is what makes the LA City Council the subject of the Occupy LA protest, not its partner. RETHINKING LA - The Occupy Wall Street movement has gone viral, spreading across the country as people of all walks gather in their respective cities to protest corporate greed, social inequity, corporate personhood, and a host of other issues that reflect the spectrum of discontent with the status quo. Occupy LA is approaching the end of its first week on the north lawn of LA’s City Hall and in that short time they have incurred the wrath of the most deadly of movement enemies, benign neglect. Protesters in New York have been pepper sprayed, arrested, and restricted by ordinance from using amplified sound while Occupy LA has competed with the trial of Michael Jackson’s doctor for media coverage. Protesters in Seattle have braved the chilly weather without tents, shivering in the cold rain as the police confiscated their supplies and arrested those who resisted the ban on blankets, sleeping bags, and “lounging” behavior. Protesters in Los Angeles have been quietly accommodated by law enforcement, cheerily visited by City Hall staff, welcomed into Council Chambers, and gifted with a City Council Resolution of Passive Support that memorializes the many issues that prompt Occupy LA to exert their 1st Amendment rights. City Council President Garcetti was joined by Councilmembers Alarcon and Rosendahl in a brief tour of the Occupy LA camp, an expedition that was prompted by earlier public comments in City Council pointing out the contrast between the theoretical debate on the council floor and the reality on the streets. To their credit, they came, they saw, and they postured. As for the residual impact on Occupy LA, they still move their tents from the lawn to the sidewalk each night in deference to the Los Angeles Municipal Code restriction on camping in city parks, a classification that applies to the lawns surrounding City Hall. LA’s City Council is missing out on a big opportunity by not embracing Occupy LA and bringing them inside, after all, there is so much City Hall could learn from the movement. Typically, the twin enemies of a protest are limited resources and resistance, challenges that either crush a movement or refine it into an effective organization. Media - Occupy LA established a Media tent on the north lawn and the events are livestreamed via internet, allowing viewers to interact at all hours with each other and with members of Occupy LA. The ongoing narrative and dialogue is complemented by the full spectrum of social media and dissemination of content is comprehensive. Contrast this with City Hall’s continued reliance on physical posting of notices in a city of 485 square miles and the gap between what Occupy LA has done in less than a week and what City Hall fumbles on a regular basis. 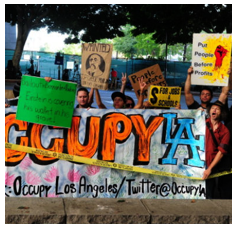 Education - Within days, Occupy LA had structured classes on the issues so that participants could move beyond experiences and slogans and into the substance of the agenda, whether economic, legal, environmental, social, or strategic. The open air classrooms offer proponents the opportunity to clarify their message and audience members an opportunity to engage in dialogue. Contrast this with City Hall and the ongoing confusion that reigns supreme on issues that include the budget, water & power, transportation, infrastructure, code enforcement, public safety, and the delivery of city services. Communication - New York authorities have enforced a ban on amplified sound under threat of 30 day jail terms so the Occupy Wall Street protesters rose to the challenge by employing the human microphone. A speaker yells “mic check” and the crowd repeats the words, the speaker continues and the crowd repeats the words, resulting in a public address system that is creative, participatory, effective, and triumphant, a small victory that edifies as well as ensures an attentive audience. Contrast this with City Hall and the degrading experience of public comment before an inattentive City Council that endures commentary as a necessary evil. Healthcare - It’s not an afterthought or a response to a crisis, it’s a basic human need. Occupy LA has it covered and that includes the range of elements that contribute to health including shelter from the elements, sanitation and bathroom facilities, wash stations, good nutrition, and social needs. Public Participation - At Occupy LA, if you show up, you’re a member. If you speak up, you will be heard. The General Assembly meets every evening and the proceedings are broadcast via internet, allowing for commentary from the viewing audience. Contrast this with the City Council’s ongoing debate over neighborhood councils, the definition of a stakeholder, the rules and regulations for participation, ethics training, and vetting and it’s evident, Occupy LA could teach City Hall a thing or two about engaging the public, treating them with respect, and creating a rewarding experience. Funding - Within hours of establishing an online presence, Occupy LA had created a funding strategy that included several mechanisms for participation, from establishing a mailing address so that supplies could be shipped to a downtown location, to runners who would pick up donations, to online contributions of money, to organized and scheduled deliveries that ensure consistent support. Contrast that with the City of LA’s inability to process permit fees by phone or online or in person unless you’re willing to trek downtown on a Friday and wait in line. Hands down, Occupy LA could teach City Hall a thing or two about how to handle money. Food - Occupy LA addresses the problem of limited resources by seeking out solutions that have more than one application. Even the delivery of pizza goes beyond simple immediate sustenance and provides diners with more cardboard for signage. Creating signs turns into an art project for kids who are learning silkscreening, all of which turns the lawn into gallery space. Contrast this with City Hall’s contempt for the public as they engage in marathon sessions with no concern for the public’s need for sustenance, all as the Council enjoys catered lunches in Council Chambers while the public sits under “no food or beverage” signs. Security - Occupy LA is aware of the potential for disorder and it responds to the opportunity by creating order that prevents problems, not by displaying force but by giving respect, lots of respect. 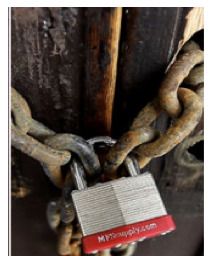 City Hall keeps the front doors locked and does more to create a “fortress mentality” than the State Capitol, clearly articulating that the people of LA are not to be trusted. Occupy LA has strategies for diffusing tension and avoiding disorder, without resorting to force. The techniques work and the LAPD is responding with similar strategies of non-resistance. Urban Planning - The Occupy LA microcosm demonstrates a sensitivity to the many elements of a “whole community” including great public space for gathering, protected areas for childcare, pockets for the different elements of the human experience including arts and culture, political dialogue, education, supplies, foodservice, active zones and passive zones, all of which communicate respect for the human experience. Contrast this with the cavalier approach of City Hall where the people of LA are treated as a burden that has the audacity to demand facilities that work, a budget that is balanced, and the delivery of city services. Occupy LA has accomplished a great deal in less than a week, demonstrating that they have admirable organizational skills and a knack for herding cats that is the essence of a successful movement. At the same time, they have been criticized for not having a cohesive platform as if the ability to raise an alarm is limited to those who also posses the solution. This is like requiring all medical patients to know the cure before they can complain of the symptom or that all malpractice suits be limited to victims who have medical degrees. Occupy LA is on the right track, they’ve raised the alarm, and the murmur of dissatisfaction is gathering momentum. Another criticism leveled at Occupy LA is that the numbers aren’t inspiring, as if there is a threshold for validity that comes with participation. The only problem with this is that it is not historical, all movements start off in bits and pieces, some fail and some gather steam, but they all start somewhere. In hindsight, there will be great debate over the tipping point, the moment at which a complaint resonated and turned into a demand, the place at which a simple campsite turned into the beginning of a journey, the point at which people looked to the left and to the right and realized that there was significant common ground and it was littered with broken promises and squandered potential. The most significant criticism comes from the pragmatists on the sidelines who contend that Occupy LA will fail because the participants haven’t suffered enough and haven’t encountered significant oppression. Apparently, the naysayers feel that righteous indignation is insufficient fuel for a call to action, a position that does more to justify their lack of action than to condemn Occupy LA, leaving them on the sidelines as part of the problem, not the solution. To contend that Occupy LA deserves a place in City Hall simply because they get sleeping bags shipped overnight, pizza delivered regularly, and keep the toilet paper stocked is overly-simplistic. Running the largest City in the most populated State in the most powerful Country in the world takes much, much more. It takes leadership and a willingness to stand up. Question for LA’s City Hall: Who are You Working For? RETHINKING LA - "Conflict of Interest" charges are fighting words and those who stand accused of serving two masters often find themselves in an uphill battle to defend their honor, their careers, and even their lives. Ethical clouds have hung over LA’s City Hall for generations, sometimes wispy and prompted by rumor and other times dark and supported by criminal allegations. Political regimes have toppled, reform movements have taken steps to ensure impartiality, and through it all, controversy follows those who speak on behalf of the people of Los Angeles. 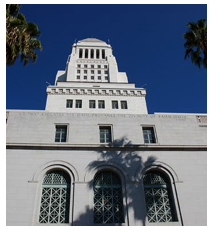 The recent Congress of Neighborhoods at LA’s City Hall included training sessions for neighborhood councils on ethics, including conflict of interest and the Brown Act. Perhaps it’s the relentless oversight of community members that has prompted some neighborhood activists to turn it around and reexamine the actions of our current Mayor and City Councilmembers. Over the course of history, a betrayal of loyalties has consistently been considered one of the most serious crimes against a community and the penalties are typically severe, ranging from excommunication and banishment to imprisonment and execution. Efforts to ensure loyalty have ranged from dangerous physical challenges in battle and co-mingled bloodlines to public oaths and legal contracts but no single effort has been able to prevent betrayal from entering the battlefield, the courtroom, the sporting arena, the boardroom, council chambers, and the negotiating room. The art of the double-deal is as old as the act of negotiation itself and some of our wisest and most revered of strategists have included elements of deception and subversion in their counsel, but that doesn’t make it right, it simply makes it common. On the one hand, the artful manipulation of loyalties carries with it the seductive glamour of a James Bond movie but in reality, the art of the double-cross is less about “the deal” and more about “the betrayal” and the sale of allegiance to the highest bidder. The people of Los Angeles are surrounded by measures that are in place to ensure that those who act on their behalf are doing so openly, honestly, and impartially. At the same time, there are those who charge that the net is full of holes and only serves to keep honest people honest while the dishonest simply grow more powerful and wealthy. In sports, professional athletes are forbidden from associating with gamblers and members of organized crime in an effort to ensure that those competing in sporting events are actually competing and not influencing the outcome for financial gain. Baseball’s Pete Rose was denied his place in the Hall of Fame because he served two masters, one was baseball, the other was a bookie. In legal circles, professionals are held to a high standard that restricts an attorney or a firm from representing any other party with interests adverse to those of a current client. In local government, elected officials are required to recuse themselves from any negotiations or actions that would benefit them financially. This can include direct benefits as well as benefits to a company or cause that has contributed to the politician. METRO went forward, allowing all members of the Board to keep the developer contributions, allowing the Board to vote on the contract, allowing the Developer to benefit from the approved contract, and motivating a member of the audience to call Tom Hayden who was surprised to be credited with the legal “workaround” saying he had never heard of it. 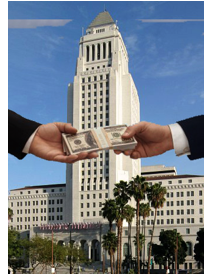 Political figures in LA’s City Hall are regulated on a few different levels, from the Fair Political Practices Commission at the state level to the Ethics Commission at the city level. Mayor Antonio Villaraigosa ran afoul of both organizations when he accepted tickets to sports and entertainment events but failed to disclose the gifts as required. Developer Rick Caruso recently made the news when he resigned from the Coliseum Commission amid charges that he serves two masters, one being the Coliseum Board and the other being USC where he serves as a trustee. USC’s football team is the Coliseum’s largest tenant and the proposed “master lease” would give more control over the Coliseum to USC. City Councilman Bernard Parks, also on the Coliseum Commission, opposed Caruso’s participation in the USC contract talks and is fighting USC’s efforts, claiming that a private school should not have control over a publicly owned stadium. On the other side of town, City Councilman Ed Reyes on the receiving end found himself of a complaint that charged him with serving two masters in violation of a state law designed to prevent public officials from also serving on boards, commissions, city councils and other governing bodies that may have interests that clash. The Los Angeles Neighborhood Council Coalition was the most recent setting for “conflict of interest” charges, coming in the midst of debate over local development issues and the city’s municipal budget. This was followed by a speaker who pointed out that the City of LA regularly engages in negotiations with the City’s Union representatives, people who also contribute campaign funds to those who run for office and who represent the people of LA. One might suggest that it cuts both ways, even a Councilmember who was not on the receiving end of Union campaign contributions would lack an impartial position if the Union contributed to their opponent and/or campaigned on behalf of their opponent. Representatives of LA;s City Attorney frequently remind the people of Los Angeles that it is the Corporate City that is the client, not the people of Los Angeles. Which master does the City Attorney serve as he takes his place at the table, next to the Mayor and the City Councilmembers, and proceeds to negotiate contracts that benefit the employees of LA while the people of LA aren’t considered “the client” and aren’t invited to the process. It is imperative that the Mayor and the City Council clearly identify the master they serve. If money has changed hands, they must acknowledge the ethical cloud that follows the money and they must recuse themselves from the negotiations. Lawyers can lose their licenses for violating specific standards that prevent even the impression of conflict. Athletes can lose their ability to compete just for communicating with known gamblers. Business licenses can be revoked if the operators are found to associate with members of organized crime. 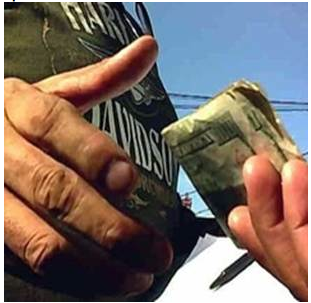 UPDATE - LA City Council's Budget & Finance Committee, on Monday, reviewed the City Attorney's most recent version of the proposed Administrative Citation Enforcement (ACE) Ordinance, punching holes in it and sending it back to the City Attorney for repairs. "This ordinance is half-baked!" 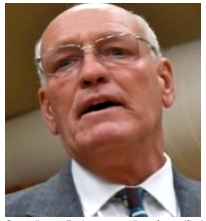 declared Councilman Bill Rosendahl as he scoffed at the notion that he should even review a draft ordinance that was only released to the public two hours before the commencement of the meeting. He added that the fact that the ACE ordinance pits neighbor against neighbor is a huge flaw and that a complaint driven process lacks a commitment to standards. Councilman Englander punched budget holes in the draft ordinance, pointing out that it lacks any measure of cost estimate, metrics for evaluating success, and that it is disguised as a pilot program when in fact it is a "phased-in implementation." Councilman Parks gave a list of specific instructions to the City Attorney's office, calling for clarification of the subpoena authority, a definition of the administrative officers, a real cost analysis, clarity of the need for positive ID requirement for those cited, a plan for collecting fines that comes from the Office of Finance, information on LAPD overtime commitments and costs for testimony at hearings, a list of violations to be included in the pilot program, and the impact on parallel programs such as the pending signage ordinance. Councilman Koretz gave the revised draft of the proposed ACE ordinance one last attempt at resuscitation, explaining that this was simply an opening move and that all financial responsibility was the City Attorney's, a claim that was rejected by Pedro Echeverria, Chief Assistant City Attorney. Councilman Cardenas was quiet, offering no words in favor of the proposed ACE ordinance, standing by as the Budget & Finance Committee called on the City Attorney to report back in 30 days with answers to their many questions and on the CLA to conduct community hearings and outreach on the draft ACE Ordinance. The standing-room-only crowd consisted of property owners, landlords, and tenants, predominantly in agreement (4 to 1) that the ordinance has many flaws. Noel Weiss referred to the CA's ACE proposal as "so incredibly and poorly drafted that it defies belief. It is an embarrassment to the City Attorney's Office because it constitutes both legal malpractice and political malpractice."